Just around the corner is the BC Home & Gardn show! Feb 22-26th at BC Place. This years show is set to to show case a mountain of ideas, savings and great new products to improve, update or add some wow factor to your home. I wanted to write just a quick posting about the show to encourage you to check out the website and be sure to buy your tickets and set the date aside! You can either buy tickets by clicking on this link OR comment on this blog posting by answering any of these trivia questions and retweet or reshare the twitter posting tagging @bcfoodieblogger for a extra entries for a chance to win 1 of 2 sets of two ticket to attend the show. BC home and Garden has been kind enough to team up with me to offer this give away. 1- What chefs will be on the cooking stage ? And what restaurant are they from? 3-What is the value of the prize for the Lifespace Gardens Sweepstakes ? Answer these questions by commenting on this posting and or on twitter and retweet the blogpost on twitter for extra entries. Bryan doesn’t believe he’s put in an honest day’s work unless he gets his hands dirty. A natural-born teacher, the Gemini-award winning host has been educating and entertaining viewers across Canada and the US since 2007 on the hit shows Disaster DIY, Canada’s Handyman Challenge, Leave it to Bryan and House of Bryan. Bryan’s quick wit and easy-going personality have made him a huge hit with viewers on all of his home renovation shows. A few kids and number of hit TV shows later, Bryan continues to tackle home renovation projects, be the spokesperson for numerous products and expand his growing businesses to include Baeumler Approved and Baeumler Custom Cabinetry. Currently filming Bryan Inc. with wife Sarah, viewers will follow the couple on their journey as they flip two investment properties while balancing their busy home lives together. 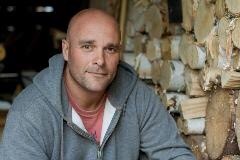 For more information about Bryan, visit bryanbaeumler.com. Exciting for myself and our foodie friends will be an exciting line up at the cooking stage featuring some fantastic local talent cooing up some signature dishes. Check out the list of chefs and dishes here! Good luck and the more you retweet the more entries you get!